Up to 500 international students will have the opportunity to study business and finance at the new Charles Darwin University (CDU) centre officially opened in Melbourne today (February 28). The centre located in Melbourne’s CBD is a joint initiative between CDU and the Australian Technical Management College (ATMC). CDU Vice-Chancellor Professor Barney Glover said the partnership would allow international students to study CDU higher education courses in Melbourne from semester two 2013. “CDU courses including the Bachelor of Business, Bachelor of Accounting, Masters of Business Administration and Master of Professional Accounting will be delivered by ATMC at its Franklin campus,” Professor Glover said. Professor Glover said that students would be required to satisfy CDU admission requirements, would be enrolled as CDU students and would follow the CDU curriculum and assessment. “Upon completion, students will graduate with a degree from Charles Darwin University,” he said. ATMC CEO and Managing Director Dr Manish Malhotra said that international education was Victoria's largest export industry and the new centre was required to handle the introduction of the CDU higher education degrees. “The new centre at 104 Franklin Street, Melbourne is a world class education facility located in the Melbourne central business district close to public transport, shops, cafes and restaurants,” Dr Malhotra said. “The CDU courses are expected to attract up to 500 new students over the next five years. 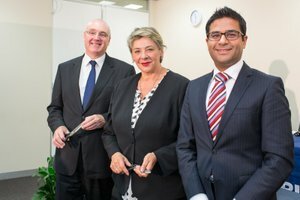 “The opening of this new centre is further proof of the strength of the international student education industry in Victoria and a reflection of the high demand internationally for Australia’s world class university degrees and recognition of the education quality being provided by the ATMC,” he said.